Easily transform your retail card reader applications with the security of encryption that meets PCI-DSS requirements with the MagneSafe Mini secure reader. A compact version of the MagneSafe Full Size, the traditional 100mm footprint reader is the ideal device to secure cardholder data from credit cards, debit cards, gift cards, ATM cards and ID cards. Self-powered from the USB port of any PC or terminal, the MagneSafe Mini quickly future proofs your environment with support for both today's existing retail applications and tomorrow's advanced security demands. Built for reliability and installation ease, the MagneSafe Mini secure reader utilizes a security architecture that combines MagnePrint® Card Authentication, Host/Reader Authentication and Triple DES Encryption. The result is a solution ideal for retailers that need to meet PCI DSS certification. 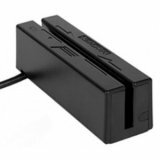 The MagneSafe Mini is 100% interface compatible with traditional MagTek® magstripe readers while offering advanced security features such as data encryption, card authentication, and device/host authentication to be activated when security requirements demand it. It is the perfect solution for environments that want to future proof their platforms for long-term compatibility.